Fiddle yards are the changing room of a Parisian fashion show catwalk for model railways. The modelled area of our layouts is the catwalk. Here we parade our trains up and down. They pull their loads along carefully and lovingly constructed branch-lines just as the models flaunt their designer’s dresses on a carefully constructed catwalk in front of the world’s press. And just as the glamorous models disappear from view to put on their next collection of garments, our locomotives need somewhere to go to change and pick up more rolling stock or to make space for the next model to come on stage. You wouldn’t expect to see Kate Moss walk up the catwalk in the same outfit twice just as our layouts get boring if there’s no variation in the trains. For layouts, this is what fiddle yards provide. Somewhere to change and make up trains between running. 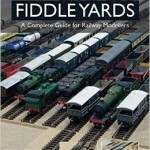 Fiddle yards also provide the link to the imaginary world beyond our layouts. Disappearing through an exit portal, our imaginations let us believe they’re on route to another station. In reality, they’re parked up, the out of sight in the fiddle yard until their next turn. Before getting into the why’s and were forths of different fiddle yard systems, it’s probably worth clarifying how they differ from their half-brother, the staging area or yard. In the US, where space isn’t typically a problem, layouts tend to have large off-stage track runs with points connecting these tracks to the visible area. Trains in areas are usually stored whole ready for their turn. 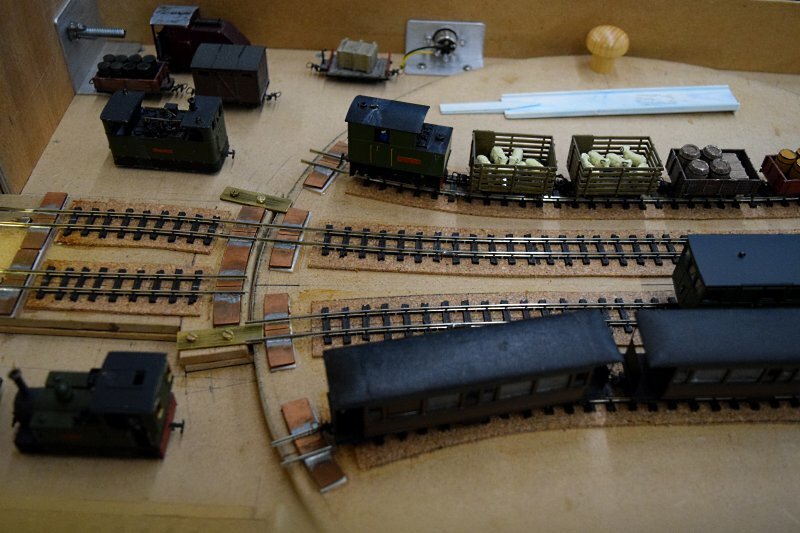 The Banbury layout, seen below at Guildford MRC’s 2018 show, is a good example of this kind of design. A staging yard on the Banbury Layout. Multiple tracks connected to the layout via points. For the typical space restricted UK layout, however, this approach doesn’t work so the concept of fiddle yards was developed. These are much smaller than staging yards and typically use some form of space saving technique to allow different trains to be made up, changed and rotated in the confined space and track lanes available. What follows are the six most common techniques for fiddle yard design. Here multiple storage tracks feed into a turntable. This allows trains to be turned around and rolling stock from collected from as many feeder tracks as the turntable supports. These require more space than fans below and cost a lot — turntables aren’t small or cheap — and can be complex to wire and operate but they do allow locomotives to be turned around. Given their cost and size, they are my least preferred solution. Here multiple tracks fan out, via points, from the line(s) to the layout. While these are great for storing whole trains waiting their turn if you want to chop and change rolling stock the fan approach can get large. Essentially, these are off layout sidings and require the same design thinking and point arrangements so can get expensive. With the typically limited space of UK layouts, I don’t have room for these on my layouts. I also find them the less flexible in terms of chopping and changing the rolling stock, runarounds (with the added cost and space requirements) are needed if you want to swap locomotive positions from rear to front of a train for example. While some other fiddle yard designs employ tracks moving horizontally or around a central point (see below), elevators and helix designs allow rolling stock to be moved vertically. With elevators, sections of track with different train and rolling stock are raised and lowered to align with the exit track onto the layout. Alternatively, they allow trains to be moved from the visible layout to staging areas below the layout. Helix designs are not as often used for fiddle yards — usually being used to move trains from one area of a layout to another that is higher or lower — but can be used, space allowing, to move trains from the layout to a fiddle or staging area above or below the layout itself. Both are popular where there is little space horizontally but more space is available above and below the layout. While impressive to watch, the obvious disadvantage of these is the price. They’re by far the most expensive option here. One of the most common fiddle yard design I see and have used in the past. Here parallel tracks are fixed to a board which is then moved forwards and backwards on runners so each track can be aligned with exit tracks. In many cases, traversers don’t allow trains to be turned although as Richard Bardsley’s suggests in Designing and Building Fiddle Yards it is possible to build them so the entire shelf can slide or be lifted out allowing it to be rotated through 180 degrees so all the locos then face forwards onto the layout. Construction can be fiddly as the shelf needs to be strong enough to tolerate regular movement and a good quality sliding mechanism is necessary to ensure smooth movement and correct alignment with the exit tracks. A big benefit of traversers is that they can offer a considerable space saving over turntable arrangements for certain types of layouts. If you have a terminus for example, with multiple lines feeding into the terminus station, a traverser — with parallel lines matching the lines going to the station — provides a great design for changing the rolling stock entering and leaving the station. By contrast, imagine having all lines from the terminus running off the layout, and curving around so as to feed into a turntable at different angles. The space requirements would be vast. 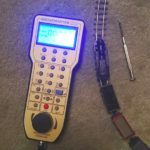 They are however practical, easy to make and generally cheap. A sector plate, compact and in this case also allows trains to be turned. Here instead of moving the board on which tracks are mounted in parallel forwards and back, tracks are laid in a fan like fashion and aligned with the exit track by pivoting the board with the fulcrum located either centrally or at one end. Rotating means a sector plate requires less space than a traverser or fan. And if, as in the 009 gauge fiddle yard on the Yoredale Tramway — Moredale 009 gauge layout seen above — this can be rotated all the way around, the trains can not just be changed but also turned around. They’re best suited for smaller layouts with limited rolling stock rotation involved. Construction is quite simple. Lay tracks on a board with a rotating bearer at one end or centrally and use copper sleepers at either side to join across from traverser lines to layout lines. My preferred option in most cases. These differ from all the above designs as there is no fiddle yard track. Instead, U shaped containers holding the trains are manually lifted out and lowered into position to allow the different rolling stock and locomotives to be run onto the layout. The cartridges are usually constructed from two L shaped aluminium pieces facing each other with the track down the centre. Alternatively, they can be spaced apart, to the gauge of the rolling of the rolling stock, in which case the edges of the aluminium become the rails. Usually, bulldog clips, as seen in the Yewston Road above, hold the cartridges in place and align the rails with equivalent fixtures on the exit to the layout. When not being used, the cassettes holding trains become a storage box with rolling stock kept above or below the layout until required. If a train needs turning, just run it off the layout onto a cassette and lift and turn the cassette around. For sector plates, traversers and cassettes power are usually fed across to the lines in as simple a manner a possible, crocodile wires with crocodile clips at each end that connect across the join are common. A handy tip, from Designing and Building Fiddle Yards is that cartridges are often tilted when being moved around so it’s useful to make the cartridges narrow so rolling stock in the cartridge can’t fall off the rails if this happens. With all of these, further space saving can be achieved with a fold-up design as used by Michael Campbell. As your fiddle yard will typically have multiple locomotives you need to ensure mechanisms are in place so only one loco moves at once when the power is attached. For DCC this obviously isn’t a problem but for DC layouts, you’d have switches to isolate the fiddle yard track from the mainline feed and switch over to a secondary controller to allow locos in the fiddle yard area to be controlled while trains are also being driven on the visible part of the layout. It’s also worth mentioning, that if your fiddle yard is at the opposite end or far away from where you operate the layout you may want the second controller positioned near the fiddle yard so you can see and access the trains at the same time as controlling them. If you’re looking for more ideas, tips and suggestions I recommend Richard Bardsley’s Designing and Building Fiddle Yards. Greetings from Florida! I’m bored at work so I decided to browse your website on my iphone during lunch break. I really like the information you present here and can’t wait to take a look when I get home. I’m surprised at how quick your blog loaded on my cell phone .. I’m not even using WIFI, just 3G .. Anyhow, fantastic site!